Any serious film director is concerned not only with meticulous representation but also with a kind of drama which must, by its nature, question the ethical rightness of things as they are…. Usually, a director is drawn to situations with maximum dramatic potential. Invariably that potential is provided by strife and friction between the individual and his environment. In the Japanese woman, Japanese directors have discovered the perfect protagonist. This does not mean that Japanese directors are feminists – even Kenji Mizoguchi, though he is often so described. It means rather that these directors in seeking objectivity as well as dramatic revelation have, naturally, shown Japanese women as they are. Kenji Mizoguchi’s Akasen Chitai (Red-Light District, 1956) had the misfortune of being tagged with the silly title Street of Shame on its first American release, and it has stuck. Doubtless meant to imply a far more salacious treatment of its subject than Mizoguchi intended, the title has also promoted the prevailing view that he was making a political statement about the class of women he had so tenderly treated through more than 30 years of filmmaking. And while it was probably inevitable that Mizoguchi should return to his favourite subject in his last film (2) – courtesans and their floating world – Street of Shame is one last, devastating look at how life’s cruelties are especially hard on women in Japan. Certainly the image of the Japanese courtesan (even the word is antiquated) had degenerated considerably by the time Street of Shame was made, partly due to the democratic reforms enforced on Japan by the American Occupation Force (3), which imposed a morality alien to the Japanese, but also because the very presence of tens of thousands of American GIs in Tokyo had led to the development of a highly lucrative trade in human flesh on a scale previously unheard of even in Tokyo’s 300-year-old Yoshiwara district (4). Made during yet another of the Japanese Diet’s debates over its “Anti-Prostitution Bill”, Street of Shame scathingly presents both sides of the bitterly contested argument (5). In the film’s first scene, the Mamasan (Sadako Sawamura) of a bar called Dreamland tells a policeman, “Yoshiwara has been here 300 years. Does an unnecessary business last so long?” And her husband, Mr Taya (Eitaro Shindo), who owns the bar, tells the women more than once that “It’s we owners who are really protecting you. We run these establishments so you won’t starve or commit suicide. We make up for the insufficient welfare policy. We’re social workers!” Yet each time he lectures them thus, the women look away pensively. Yumeko (Aiko Mimasu) has a grown son for whom she has made the sacrifices of her life. She goes to the country to visit him, only to learn that he, too, has gone to Tokyo to find work. A shopkeeper along the bus route tells her, “You can wipe off your rouge but not the make-up of your trade.” When Yumeko finally meets her son outside the toy factory where he works, he disgustedly condemns and disowns her. That night, back in Dreamland, Yumeko goes insane and is taken off to hospital. Then there is the lovely Yasumi (Ayako Wakao), who makes more money than all the others and is always ready to loan them money – as long as it is paid back with interest. She saves everything she earns, bilking two men to the point of their ruin in the process (one of them nearly kills her when she rejects his proposal of marriage). She seems entirely preoccupied with money, until we learn why: her father is in prison and she has ruined her life to bail him out. Throughout the film, Mickey (Machiko Kyo) tells everyone the brutal truth and is totally cynical about her profession. When her father shows up and demands she come home, she kicks him out, upbraiding him for his treatment of her dead mother. Divested of her illusions of a rosy future, she takes her life as it comes without the promises of the future or the burden of the past. The film closes on a note of hope and of heartbreak. Yasumi has used her money to open a bedding and quilting shop that does business with Dreamland. Mr Taya and the Mamasan wonder at her success, without for a moment grasping the cost to her life. Yasumi stops in to greet the other girls “for old time’s sake” and glibly tells them that she is also available for loans. But Mizoguchi doesn’t end there. A new girl, Shizuko (Yasuko Kawakami) is having her “debut” in Dreamland and the Mamasan gives her advice as she performs the ritual of applying white powder to her face and neck. Shizuko only sits there with her eyes downcast. And it is her anxious face we see in the film’s final shot, cowering at the doors of Dreamland, calling out in a crushed voice to men passing in the street. 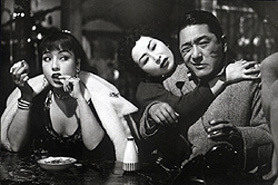 Mizoguchi returned to Daiei Studios for this film, after intermittent work for Toho, and gathered around him many of his old friends – the production designer Hiroshi Mizutani (who had worked with him since 1933), the cinematographer Kazuo Miyagawa, and actresses Michiyo Kogure and Ayako Wakao. After making his inimitable mark as the premiere director of period dramas (jidai geki), he went to some lengths to alter his customary production design in Street of Shame, evoking the squalidness of his setting with a heightened realism not often seen in Japanese films at the time. The brief final scene, in which a young girl must take her first tentative steps into a life that has ruined nearly everyone in the film, is a mark of Mizoguchi’s genius – the bar abutting onto the cramped street, innumerable men strolling through it in their oblivious freedom, the girl dressed in her unaccustomed finery, the cries of entreaty (“Come inside, sir!”), all combine to evoke a heartbreaking vision of hell. Except it was only sprawling, labyrinthine Tokyo, circa 1956. Donald Richie, A Lateral View: Essays on Contemporary Japan, Japan Times, 1987. Leukemia killed the director shortly after completing the film. The US occupation officially ended in 1952. The surrender of Okinawa by US Marines didn’t occur until 1972. And thousands of US forces still “occupy” Japan to this day. The very origin of the Japanese word for “foreigner” – gaijin – is often traced to “GI”. On its release, Street of Shame was a hit in Japan, and it is commonly believed to have been instrumental in the ultimate passing of the Anti-Prostitution Bill.